It has taken a little while for me to gather the thoughts and words for the transition I went through this summer. I am a very full person, I am great full for all that I have and am afforded the luxury of exploring avenues to find out who I am. I am dynamic and have a lot of interests. I also live in an area where the weather can determine my interests at any given time because minus temps and snow can make it hard to be committed. This I know for sure, I am very committed to my horses, their way being and the philosophy of their way of being. These animals require a unique equality and humane treatment. This is very important to me and is translated through the level of care and respect they receive. Horses are large animals with even larger hearts. They have certain monetary requirements in order to maintain a good balance care system for them. This means quality feed, safe shelter and infrastructure, hoof maintenance, assorted tools and equipment such as sawdust and blankets. Horses consume me, they are my life blood. The horses ground me and keep me balanced. Give me greater perspective to the world and nature yet they ask for nothing in return and I honour them by my care. My beliefs and what the horses have taught me through my own personal experiences are that they are great healers, amazing and majestic creatures and to be in their presence is a gift unlike any monetary object. The horses in allot of ways can be the polar opposite of my other interests such as car culture, tattoos and Pin Up. Last summer my confusion in my contrasting interests really came to a head for me. I wondered that in some way I was no longer honouring or being true to myself..? If I could be so opposite from one day to the other, was it a contradiction to be full and satisfied by the horses yet dressing up and playing in Pin Up style the next. I learned life is what you make of it and the intention behind your actions. 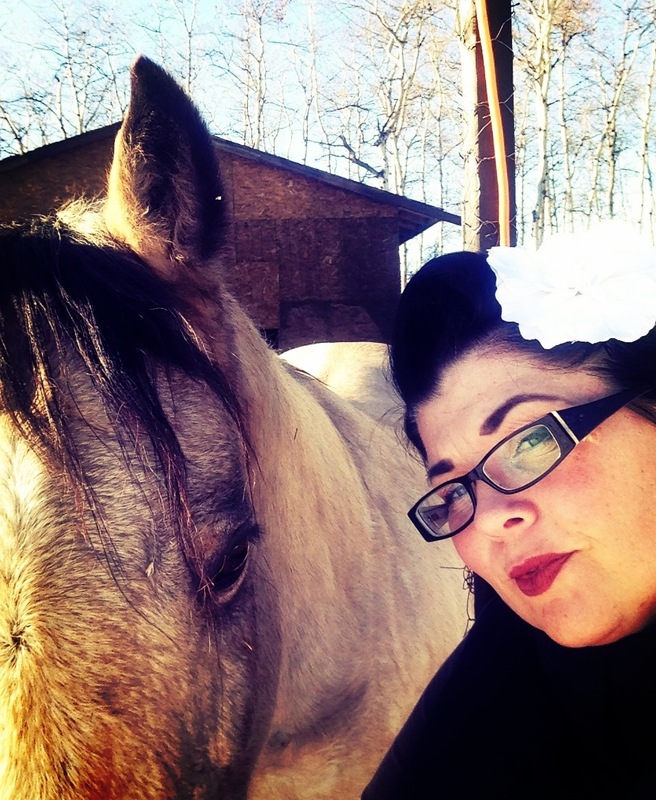 If you would meet me with the horses you would get to know me on a more personal and deeply connected level. As I consider the farm to be a spiritual place and the horses great and wise teachers you would feel and learn that only a stripped down most intimate self will be acknowledged here. The horses do not recognize your external veneer they see your spirit, the internal essence of yourself that shines from with in. Regardless of what you hold inside, regardless if you have walls made to protect yourself, pain or dis-ease in your body, regardless. These horses see you as you are. I was aware that anytime I would dress up, the horses were not as interested to interact or participate in the charade. I felt Boss Mare Betty was the pretty and sparkly side of me. I did not see that I already was yet her coming out would serve as another way to teach me and make me clearer and aware that I could be all that I never knew I was. I am a very self protecting type of person that does not trust easily and yet Boss Mare Betty put me out on a social platform I did not expect and has taught me allot. One thing I never realized was the desire and need for validation. I owe allot to the brilliance of my Pin Up self as she has helped me see I can get myself and my thoughts out to the world and support the foundation of my beliefs. I am now aware I can do this for myself to get my most cherished beliefs of the horses out to help others. It was nothing short of a blessing the day I was referred to Rowena’s. I never expected the woman I have grown into through purchasing their styles and fashions. This in a way sounds shallow and contradicting yet I never saw myself as a pretty girl and the evolution in itself is at such a large magnitude for me it is anything but shallow. I have more than one girl needs in terms of dresses and shoes and after the purchase of the Floral exclusive Heidi I stopped purchasing dresses because I knew the balance was off with the horses and I needed to look inside and understand what my intention was. I was on the cusp of more than one monumental change in my personal perspective. I would be home schooling my 2 boys and being their facilitator my time was going to change. I also needed to decide of I kept Boss Mare Betty’s page going. Knowing I did not have personal pictures to post and then not the time to write I had to come up with another reinvention. The snow has come and the temps dropped. I started to look through new eyes at life and perspective and I am great full for all that I learn and have learned I also discovered with my new intention in regards to Boss Mare Betty the horses regarded the transition differently too. When I came to the understanding that I did not need the dresses rather want them and keeping my desire in perspective and clear intention the horses no longer shied away from me rather they came forth. Since writing this I have acquired 2 new dresses and I feel great about them. I know that there can be balance and that you can express yourself in different mediums as long as you are true to yourself. I am so happy that I stumbled upon your blog. This post is so deep, so utterly profound, I will have to read it a few more times to truly appreciate your journey and to take inspiration for my own, as I reconnect with my love of retro pinup styling. Your comment means allot to me as I had been apprehensive to post this.